Strings, Keys and Melodies: Finger Play Fun Day- "Take Care of Yourself!" Welcome to Finger Play Fun Day! In honor of the athletes in the Olympics, I have written a song about taking care of yourself! It is a simple song about eating your veggies, running, jumping, biking and playing and reading everyday! 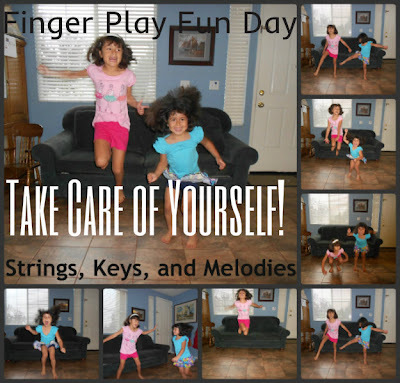 All activities we should be doing everyday! Take care of yourself everyday. Carolyn at Wise Owl Factory has written a post all about the Olympics. Be sure to check out her book reviews and printables. 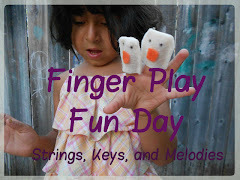 She always provides awesome printables that children enjoy doing! Here is another Olympic song displayed as a PowerPoint Storybook. Do the motions of the actions in each verse as you sing this song! 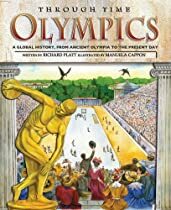 Be sure to check the Olympic books we have in Our Music Store. Read a review from Wise Owl Factory on Through Time Olympics. 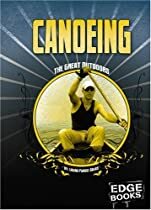 Be sure to read the review by Wise Owl Factory for Canoeing The Great Outdoors! If you buy any book or resource through Our Music Store we will earn a few pennies! 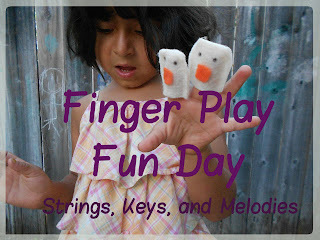 Visit Finger Play Fun Day for a list of past finger plays! What a wonderful and timely song as it fits so well with the Olimpcs starting today. Smart parents will emphasize the athletes eat well and exercise over the number of medals to encourage their children to do the same. Your post and song will help them do just that! I was texting, that should have been Olympics! I'm glad you like my song, Angelique! I would love to collaborate more!